Beautiful Twin-S Electrode design, small rectangle high tempered glass platform 11"x9.6" (28 cm by 24.5 cm) best for ladies and girls. 3.25" extra large nice blue backlight LCD screen. Automatic identify up to 4 users (2016 version, auto reset data). powered by 4xAAA batteries (included). 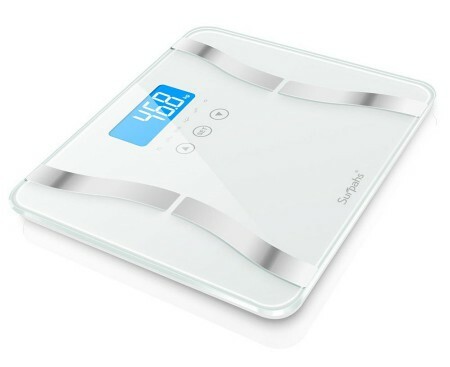 This is an upgrade version of the original Surpahs DS1 model body fat scale, feature added: auto reset data. This multi-function digital body fat scale provides accurate body weight measurement and tracks body fat, total body water, muscle mass, bone mass, and kcal, it tells you how much kilo-calories you need to consume each day to keep your body weight. It hold up to 4 user profiles, 11x9.6 inches retangle high tempered glass platform and 0.90" (23mm) thickness, sleek, low-profile, modern design and its ability to monitor personal fitness levels, it is a perfect tool for any family. Surpahs 100% satisfaction guarantee. 100% worry-free guarantee. Registered customer receives extended warranty.